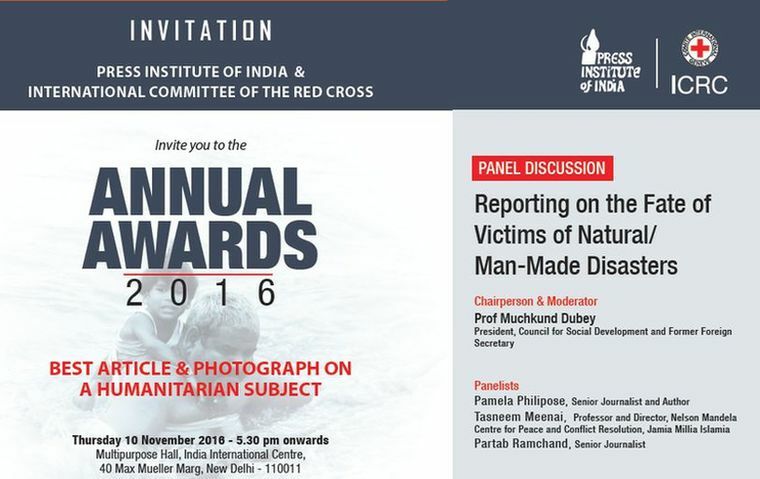 On 10 November 2016, the 10th Annual Awards for reporting on a humanitarian subject will be announced by the Press Institute of India (PII) and the ICRC in New Delhi. This year’s theme was ‘Reporting on the Fate of Victims of Natural/Man-Made Disasters’. Winners will be rewarded for the first, second and third positions across two categories — Best Article and Best Photograph. In both the Print and Photo categories this year, the first prize is INR 60,000, second prize INR 40,000 and third prize INR 25,000. The awards will be presented for articles and photographs on a humanitarian subject that have been published in an Indian national or regional newspaper or magazine between April 2015 and March 2016. The awards are presented annually to promote and recognize outstanding work of Indian journalists in the field of humanitarian reporting that underscores the human suffering caused by disasters and situations of violence, and highlights extraordinary resilience shown by people in such times.